Choose one of the sections below to read more about the history of Badminton Horse Trials on the estate, past results and our longstanding relationship with our title sponsors, Mitsubishi Motors, with whom we celebrated 25 years in 2016. The dukedom of Beaufort was created in 1682, being granted to Henry, 3rd Marquess of Worcester in reward for his service to the Stuart monarchy. The Manor of Badminton was purchased by the Worcesters in 1608, originally for a younger son of the family. The Estates came back to the main branch of the family in 1655 and in the middle 1660s rebuilding of the old house started. The 1st Duke of Beaufort retrieved the family fortunes which had suffered badly in the civil wars and made Badminton his home. The house today therefore dates from 17th and 18th centuries. The 1st Duke appears to have been his own architect – spending around £30,000 over 30 years, a vast sum for the time. The 3rd Duke (1707 – 1745) remodelled the house again. Architect James Gibbs made some major changes to the East and West wings (which are now as he left them) and then William Kent completed the North front, giving it its Palladian appearance, adding height and emphasis with the unusual pediment and two cupolas. Badminton House is now the family home of the 12th Duke of Beaufort, Harry Somerset who has always taken an active role in the event. His Grace’s father, David, who passed away in August 2017, was President of the Horse Trials and was himself a very successful rider in the sport, being placed second here in 1959. It was the 10th Duke of Beaufort whose idea it was to hold an event in his Gloucestershire park in order that British riders could train for future international events. The first event was held in 1949. When Golden Willow won the first Badminton competition, there were 22 starters from two countries, Britain and Ireland. Since then Great Britain has won 3 team golds and 2 individual gold medals in the Olympics; 6 team golds and 5 individual gold medals in the World Championships, and no fewer than 21 team golds and 18 individual gold medals in the European Championships. For the first 10 years, the dressage and show-jumping arenas were sited on the old cricket ground in front of Badminton House. Torrential rain in 1959 turned the park into a sea of mud and the arenas and tradestands were moved to the present site. The very first European Championships were staged at Badminton in 1953. The winner was Major Laurence Rook on Starlight XV. The Trials were first televised in 1956. in 2011 there were some 15 cameras covering the event for programming transmitted by the BBC and in countless overseas countries. In 1955, the Trials were moved to Windsor for one year at the invitation of The Queen, to hold the 2nd European Championships. In 1956, the Steeplechase course was moved from the Didmarton point-to-point course to the site at The Slaits, where it stayed until discontinued in 2006. Since then the Trials have been “Short Format”, without Roads & Tracks or Steeplechase. The Start and Finish were moved into the Main Arena in 2003. In 1959 it was decided to run the Trials in two sections – The Great and Little Badminton – though both sections jumped the same course. This was due to the popularity of the sport and the number of entries. This was abandoned after the 1965 competition, since when there have always been two days of dressage. 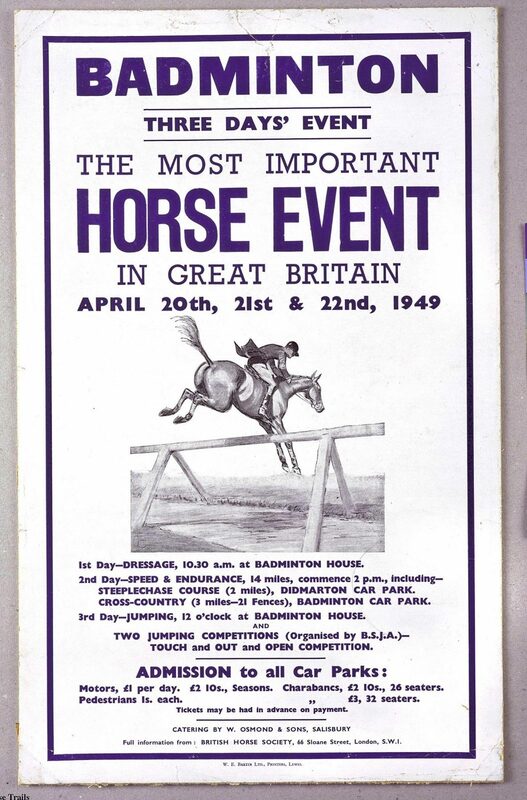 In 1961, Messrs. Whitbread took over the sponsorship of the Badminton Horse Trials and this continued until 1991, one of the longest sponsorships for any sport. Mitsubishi-Motors, importers of Mitsubishi vehicles to the United Kingdom and based in Cirencester, took over the sponsorship in 1992, initially for three years. 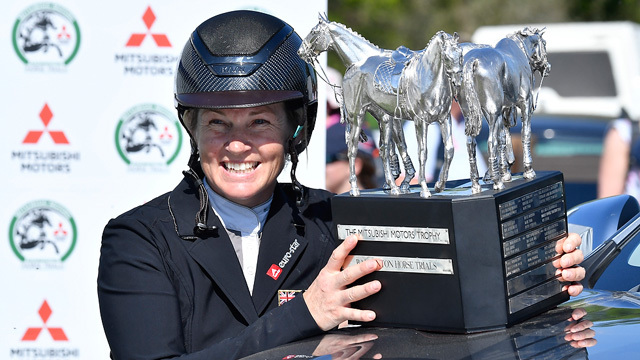 Riders compete for the silver Mitsubishi Motors Trophy designed and produced by the Wiltshire-based sculptress, Judy Boyt. Mitsubishi Motors were awarded the Animal Health Trust Eventing Award for their contribution to Badminton and the sport in 2011. Bad weather has forced the cancellation of the Trials on four occasions – in 1966, 1975, 1987 and 2012. The terrible weather of 1962/63 which continued into the spring, forced Badminton to down-grade to a one day event. Foot and Mouth disease caused the cancellation of the 2001 Event. Mark Todd (New Zealand), on Bertie Blunt, rode two-thirds of the 1995 cross-country course with only one stirrup.The horse was unfortunately eliminated at the final Horse Inspection the following day. The following year, the partnership won the Mitsubishi Motors Badminton title. 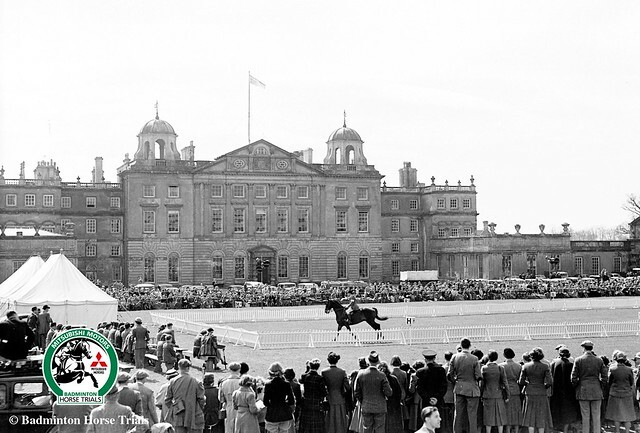 It was in 1981 that the Inspection of Horses moved to the North front of Badminton House. Until that time, it had always taken place in the courtyard of the stables at Badminton. An Armada Dish is awarded to any rider who completes the competition five times – see Armada Dishes for more information. The prize money for the inaugural 1949 event was £150 to the winner and a total of about £500 in all; by 1965 this had ‘progressed’ to £250 and £750 in all; in 1975 to £1,000 and £3,500 in all; in 1985 to £5,000 and £15,000 in all; in 1995 it was £22,500 and £92,000 overall, in 2005 it was £50,000 and £190,000 overall. At the 2015 competition the winner took home £80,000 and the total prize money was approximately £330,000. In 2017 the total prize money was £360,000 with £100,000 going to the winner. In 2018 the winner took home £100,00 and the overall prize fund (including competitors placed to 20th position) was £360,750. The car parks, tradestands, arena and cross country courses fit into an area of approximately 200 hectares (500 acres) of Badminton Park. Directors of Badminton Horse Trials; Lt. Colonel Trevor Horn (1949-56), Lt. Colonel Gordon Cox Cox (1957-64), Lt. Colonel Frank Weldon (1965-88) and Mr. Hugh Thomas, 1989-present day. The late Colonel Frank Weldon, MVO., MBE., MC., was associated with the “Great Event” as a competitor, Official and Director for 36 years. 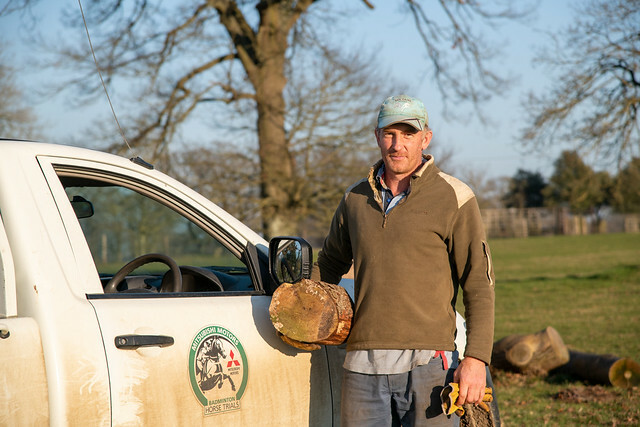 Fence builders at Badminton – Charlie Chapple; George Stoneham and Alan Willis; Alan Willis and Gilbert Thornbury; Alan Willis and his sons, James and Tim. Alan and his sons are internationally acclaimed and were course builders at the Sydney Olympics in the year 2000 and built the World Equestrian Games course for 2002. They were also the course builders for the Olympic Games in Rio in 2016. In 1948 the Olympic Games – the first of the post War era – were held in Great Britain, based in London. The Three Day Event took place at Aldershot, with the Cross Country at Barossa, Camberley. A British team competed, without much success. Before the War the competition had been largely confined to cavalry officers and the only training for the team was their normal cavalry exercises. Women were naturally not allowed to take part! The 10th Duke of Beaufort attended the event as a spectator and immediately recognised that the hunting and racing traditions in Britain should enable riders to do well in this Olympic competition. He suggested that an annual competition be organised on his Estate at Badminton, to give riders experience and assist in the training and selection of an Olympic team. The Duke was involved with horses all his life – his major passion being fox hunting. He was Master of the Horse for the Royal Family, responsible for the organisation of the equine side of all ceremonial occasions. He asked the recently formed British Horse Society to organise the proposed Trials and Col. Trevor Horn agreed to act as Director, assisted by Col. “Babe” Mosely. The Badminton Estate has been in the possession of the Beaufort family since 1608. The family itself is descended from John of Gaunt, son of King Edward III. The house and parkland date from the 17th and early 18th centuries, when huge expenditure for the times produced the house as we see it today and the park modelled by William Kent and Capability Brown. Badminton in the 20th century was probably best known as the centre of fox hunting for the whole country – the 10th Duke being seen as the expert on all matters relating to hound breeding and the art and science of the chase. The greatest number of completions by a horse is shared between Ballycotton (1990, 1991, 1992, 1993, 1995 and 1997);Over To You (1998, 1999, 2003, 2004, 2005, 2006, 2007); Lenamore (2005, 2006, 2007, 2008, 2009, 2010, 2011); Comanche (2003, 2004, 2005, 2006, 2009, 2010, 2011). Bill Roycroft (Australia) on Our Solo (1960), Laurie Morgan (Australia) on Salad Days (1961), Mark Todd (New Zealand) on Southern Comfort III (1980), Mark Todd (New Zealand) on Horton Point (1994), Mark Todd (New Zealand) on Bertie Blunt (1996), Andrew Hoy (Australia) on Moonfleet (2006), Lucinda Fredericks (Australia) on Headley Britannia (2007), Mark Todd (New Zealand) on NZB Land Vision (2011); Jonathan “Jock” Paget (New Zealand) on Clifton Promise(2013). Sam Griffiths (Australia) on Paulank Brockagh (2014). Andrew Nicholson (New Zealand) on Nereo (2017), Jonelle Price (New Zealand) on Classic Moet (2018). Winning Mares: Emily Little ridden by Captain Mark Darley in 1952, Bambi V ridden by Margaret Hough in 1954, Peggoty ridden by Captain Martin Whiteley winner of Little Badminton in 1960, Headley Britannia, ridden by Lucinda Fredericks in 2007, Paulank Brockagh in 2014 ridden by Sam Griffiths, Classic Moet in 2018 ridden by Jonelle Price. Winners – Great & Small, Young & Old and Grey! 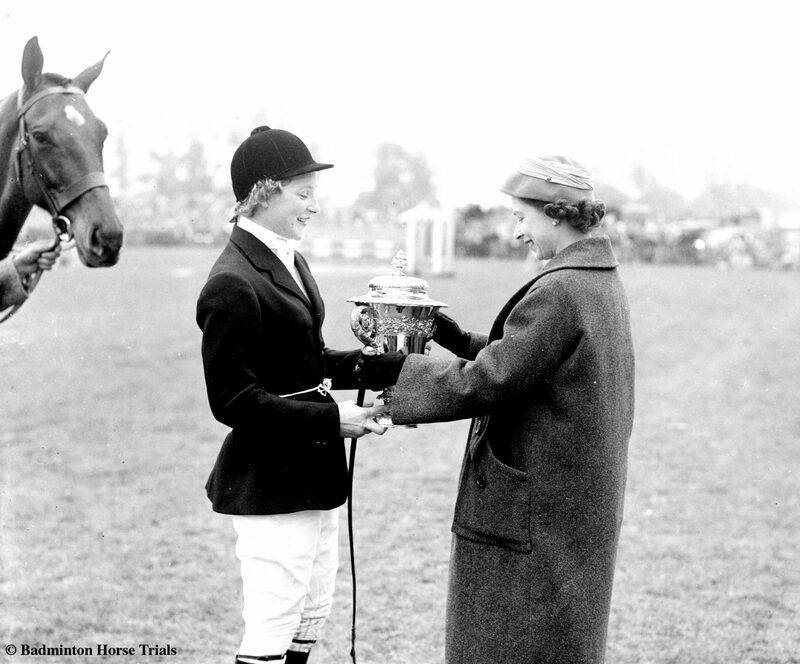 Sheila Willcox (Mrs. J. Waddington) is the only rider to have achieved a hat-trick of wins with High and Mighty in 1957 and 1958, and on Airs and Graces in 1959. She almost set up a remarkable four-timer when, in 1956 on High and Mighty, she was runner up to Colonel Frank Weldon on Kilbarry. She did win a fourth Badminton title winning Little Badminton on Glenamoy in 1964. The smallest horses; Our Solo (Australia) in 1960, and Our Nobby, ridden by Jane Bullen (now Mrs. Tim Holderness-Roddam) in 1968. Both were 15 hh. The biggest horses to take the Badminton title have been Durlas Eile, Major E.A. Boylan (Ireland) in 1965, Columbus, Captain Mark Phillips in 1974, Custom Made, David O’Connor (USA) and Word Perfect II, Christ Bartle in 1998. All were 17 hh. The youngest rider to win at Badminton was Richard Walker, aged 18 and 247 days, when he rode Pasha to win in 1969. The youngest horse winning at Badminton was the five year-old Golden Willow, ridden by John Shedden in the very first year of the competition. Nowadays 7 years is the minimum age for all competing horses. The oldest rider to win at Badminton is Mark Todd aged 55 in 2011, followed by Andrew Hoy (47) and Chris Bartle (47). The oldest horse to win the Championship is Lynn Bevan’s Horton Point, 16 years, ridden by Mark Todd (New Zealand) in 1994. Five grey horses have been successful since the start of the event – Columbus, Captain Mark Phillips, in 1974, Beagle Bay, Lucinda Green, in 1984, Welton Houdini, Ginny Leng, in 1993, Flint Curtis, Oliver Townend 2009 and NZB Land Vision, Mark Todd 2011. Completed the most times – Andrew Nicholson (NZL) is the holder of this record with 37 times (winning in 2017). Previously Lorna Clarke held the record with 22 times. Lorna retired after the 1992 event. 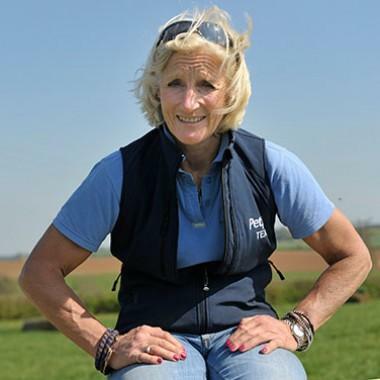 Riding three horses in the same competition at Badminton has been achieved twice. Bill Roycroft (Australia) rode Eldorado, Stoney Crossing and Avatar in 1965. Roycroft was second on Eldorado and sixth on Stoney Crossing which, the previous month was third in the Cheltenham Gold Cup behind Arkle and Mill House. Five years later in 1970, Lorna Sutherland, now Lorna Clarke, also rode three horses on the same day – Popadom, Gypsy Flame and The Dark Horse. Riders are now restricted to riding no more than two horses in the same competition.